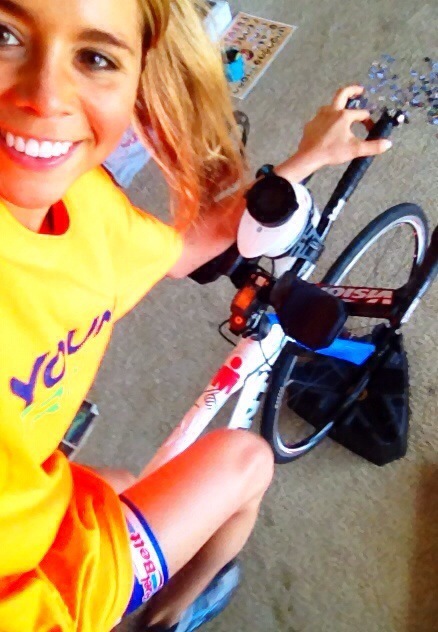 Above – YoungTri Ambassador Dre rocking her YoungTri orange shirt while spinning indoors on a trainer! She’s home for break from San Diego State University in Austin, TX – and is enjoying taking the time to continue her training at home! One of my favorite parts about winter break is being able to really focus on working out. Spending the days focusing on fitness without any other distractions. If you’re home for an extended break (or just want to focus a bit more on your winter fitness), try spinning inside more! Spin classes, indoor spinners (like the cycleops), and bikes at the gym can all be great ways to jump start your winter workouts. Do you like spinning indoors? How often do you make it a part of your winter workout routine?